It usually takes me about a month to get around to making a meal from a new cookbook – a week while it sits in the envelope waiting for me to have time to open it. Another week or two sitting on my end table waiting for me to sit down with nothing else to do. Maybe a few days waiting with some folded corners marking recipes I thought sounded interesting. Then a new recipe might make its way onto the next week’s meal plan, and if all goes well, I actually try it out. 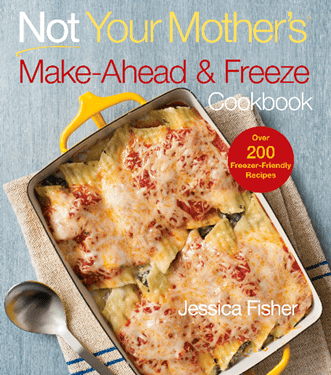 I just received Jessica Fisher’s new Not Your Mother’s Make-Ahead and Freeze Cookbook last week, and I’ve already made two new recipes from it. It’s refreshing to hold a book in my hands that is geared toward saving time and cooking quickly AND totally demonizes canned soups and convenience mixes, just like I do! Jessica won’t put up with canned cream of mushroom soup, and she makes her own spice blends. All the recipes that I’ve read so far (what, you don’t read cookbooks? They’re the best!) need little to no adjustments for total real food bliss. “Did you name them yourself, Mom?” my 4-year-old asked about our dinner – apparently she’s a Sloppy Joe rookie! Maybe we should call them Sloppy John’s…you would have thought that if you had seen our 14mo John after about six helpings and his “I do it myself” eating attitude. Many of Jessica’s recipes include a little (or a lot of) spice and not so much sweet, which is just how our family likes things, too. I was pretty sure we’d have a winner on our hands when the Sloppy Joe description talked about many recipes being too sweet for people, but not this one. The Sloppy Joes, served over those gluten-free box mix biscuits that I discovered in my kitchen reorganization, received rave reviews from all five of us. The recipe was incredibly easy to follow, and the fact that I only had one pound of ground beef when it called for two didn’t seem to matter – I filled in with some cooked lentils I had frozen last time we made tacos and a bit of ground beef heart from the freezer. (The lentils are a great way to accomplish the “spending less” part of “eating well.”) Notice how I relied on my freezer stash to make a meal from a freezer cookbook. Nice touch, don’t you think? I had to make a spice blend from Jessica’s sister to use in the sloppy Joes, and as I was mixing the basic items, garlic powder, onion powder, cayenne, paprika, and a few more, I realized I was basically committing to making more recipes from her book so I didn’t waste the rest of the blend. Luckily, the other recipe I chose used the blend as well! Creamy Cauliflower soup was also a hit and made a nice big pot, which I love. We use it for easy leftovers rather than freezing it, but it’s nice to know when things freeze well. For my own tastes, I thought the celery was a little heavy, but that’s easy to change next time. I noticed that many of Jessica’s recipe, including this soup, call for dill, yet another reason her family and mine would get along just fine – we love dill. The recipes in Not Your Mother’s Make-Ahead and Freeze Cookbook are simple, whole foods cooking, with everything from homestyle all-American fare to spicy Mexican to Indian and more. The book is peppered with time-saving tips, and of course the whole point of freezer cooking, which Jessica does in small pieces instead of a three-day marathon, is to make life easier and mealtime quicker. This mother of six is a master at it, and I love learning from her. I hope you can find some new family favorites in this cookbook, too! Disclosure: I received a product in exchange for my honest review. And you know me, free products don’t change my opinion when I review something. This post contains affiliate links from which I will earn a commission. See my full disclosure statement here. Next Post » Newsflash! Quest for Local Food Causes Katie to Eat Soy-Covered Soy! I have been dabbling with freezer cooking, but never make the whole “menu” for budget considerations (we limit meats, use more rice and beans). This looks perfect. and Life as Mom looks great! Put it in my Pulse Reader (rss) along with KitchenStewardship. Favorite use for our freezer? To store our homemade ice cream, of course! I kid, I kid. I like to make double of some of our dinners and have something ready for nights when I need something quickly! I can’t figure out how to subscribe to Life as a Mom, but I want to! Looks great! Love your website and the idea of freezer cooking! You need to use the Rafflecopter box above to enter. Just click on the down arrow of the first item. A box appears for info and/or “I’m a fan”, etc. Each time you complete one entry, your count of entries out of possibles shows on the top right of that box. Finished entry lines are faded-looking. You can always come back and update it until the deadline. You have no idea how timely this is! I’m in my last trimester and trying to prepare lots of meals for when baby comes…in fact, just yesterday I was googling this subject, getting frustrated by all the “cream of”s included in recipes. So even if I don’t win, this is timely! Thanks, Katie! Thanks for this giveaway Katie! Right now, I’m thankful to have breastmilk in the freezer, just in case! But I also really appreciate being able to double a dinner like burritos and have something easy for a night when I don’t have time to cook. The best bonus is having fewer dishes that second night, too! My favorite use of the freezer is stocking up–freeze garden veggies for winter use. The usual use of our freezer is for meat. We order organic meats from a supplier that delivers 4 times a year, so depending on how long it has been since a delivery, the freezer may be stocked full of meat. I also like to keep extra loaves of homemade bread, tortillas, granola, etc in the freezer. Kids’ favorite use of freezer: when Breyers ice cream goes on sale! We use our freezer to store whole chickens (naturally raised) and grass fed beef we buy by the quarter cow. Plus all the produce and fruit excess I can get a hold of….let’s see also breads almost gone bad and cut up to make stuffing with, freezer jam, etc., etc. Already suscribe to FB and emails on Kitchen Stewardship but will go on your Rafflecopter thing to enter the contest. Love your posts. FYI: To subscribe to Life as Mom, go to her website, look at the very top blue band for symbols. The envelope symbol will show subscribe when hovered over. When clicked on, it goes to Feedburner for your e-mail address. I love preparing extra to have in the freezer. I almost always have breakfast burritos, bean burritos, soups/stews, and homemade cookies. So much easier to cook with real food when some/most is already prepped for you. I mainly use my freezer to store meat, popsicles and ice cream. This cookbook looks awesome . Most of the freezer meals you normally see aren’t “real food” friendly, so this is great. I like to double or triple cookie dough recipes and freeze for quick warm cookies. I also double muffin recipes to freeze. We have 3 freezers. The small one in the kitchen refrigerator is the busiest. It holds lots of zip freezer baggies that contain things like sauces, shredded cheese, homemade chicken broth, cooked rice, homemade bread crumbs, single buns leftover from a package. Which is enough to hugely frustrate my dear husband when they all come sliding out as he opens the door to get an ice cube. My favorite use of the freezer is to load up on meat that is on sale and use it to make and freeze entrees. I use my freezer to make my own convenience – and subscribe to the theory of why make one when you can make 4! My freezer is loaded with baked goods, meals, cooked staples like beans, and meat. I love freezing leftover soups, love freezing berries for smoothies, and I wish I had a bigger freezer because I’m always running out of space. My favorite use is how it allows me to stock up: fresh berries in the summer, meat when it’s on a great sale, etc. I’m new to all the healthy cooking, and eating whole foods, having stubled on the Unprocessed October theme just days ago. So I’ll confess my freezer is packed with boxed foods, and ice cream. I hope to change that in the near future, but I know it will take baby steps. This book would be perfect for me, a newbie in healthy and whole food cooking. My favorite use of the freezer is for homemade soup and marinara sauce. Katie, you should probably just close comments on giveaway posts. 🙂 No matter how many times you say “comments don’t count as entries” there will always be people who try anyway… ha ha. Favorite use of the freezer – homemade broth and also for frozen fruit for smoothies. Would like to give freezer meals a try!